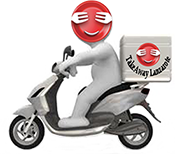 Best Indian Takeaways Restaurants with Delivery Services in Puerto del Carmen Lanzarote - Best Indian Food Delivery Restaurants - Takeout Meals at your Home or Office - Call 0034 691 555 161 or Order your Favorite Indian Meal online - Puerto del Carmen Lanzarote, Canarias. Biryani Dishes There are 7 products to choose from. Takeaway Lanzarote - Restaurants Puerto del Carmen Aromatic basmati rice cooked with cashews, ginger, garlic paste, cloves, cinnamon, green cardamoms, mace powder, bay leaves, cashews and raisins, flavored with saffron.